The Forearm Forklift lifting Straps are a pair of straps designed to make lifting heavy objects much easily. This product has been around since 1997, and in the same year awarded "Best New Product". It claims to reduce upto 66% of the capacity or upto 600 pounds. The Forearm Forklift works by keeping the centre of gravity as low as possible which allows you to carry furniture and applicances in an upright position hence helping reduce back strain. With your help we can reach more people and let them know about Forearm Forklift Lifting Straps whether this product works or not. I was amazed at how this product helped. I have moved 3 times in the past 2 years and this has made things much easier. it basically forces you to bend your knees to lift and you automatically have good posture. 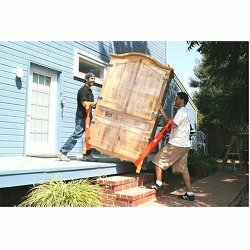 the big issue with this product is that its very easy to use when moving heavy items on level ground or up a small ramp (such as a moving truck). but going up steep stairs is difficult with these. so much so that we end up taking them off and just carrying things up stairs. there may be an easy wa to do it with the straps but we havent figured it out yet. All in all I wouldnt move without them. Takes all the dread out of moving those heavy items. Yikes! Call Center in Another Country! I ordered the product on 01/19/09 despite the poor reviews I read here as well as on other sites. I mistakenly placed two orders online and called to cancel one. I was on hold for about 25 minutes before I got through. I could barely hear the person on the other end because it was so noisy. I was asked to call back since my order was not in the system. I called back today, 1/20/09 and again waited for about 25 minutes before I got through. I finally reached an associate who attempted to talk me out of canceling the additional order. I have to admit I became annoyed with their poor level of customer service and how noisy it was in the background. I canceled both orders. However, I had to be put on hold for an additional 15 minutes to do so. I do not want to order a product from a company who outsources its call center to India or whatever other country they choose to. I really want an affordable airbrush kit but the customer service is very poor. Also, yes they do hire bloggers to talk highly of the product on review websites. Bottom line, beware of their business practices. By the way, I only gave Luminess 1 star because the website would not allow me to leave none. Good luck.